You have heard about the first time home buyer tax credit and you want to take advantage of it by purchasing your first Spring Texas home. But there is only one small problem, 100% financed mortgage loans are no longer available and that means you need to come up with a down payment. So how do you come up with a down payment for your first home? First, you need to know how much money you will need for a down payment? Let’s say you have received loan pre-approval for a $140,000 home. The loan with the smallest minimum down payment requirement is a FHA loan and it is 3.5% of the sales price. Okay so pretty easy math ….. $140,000 * 3.5% = $4,900 down payment required for the loan. You are going to need a little bit more money though before you can buy your first home. You will need some money to pay for inspections on the home, to buy a washer / dryer and a refrigerator, and to pay for movers. Let’s estimate $500 for home inspections, $800 for a washer / dryer set, $800 for a refrigerator, and $500 for movers which totals up to $2,600. For the down payment on the $140,000 home and for other costs the total amount of money you need is $4,900 + $2,600 = $7,500. 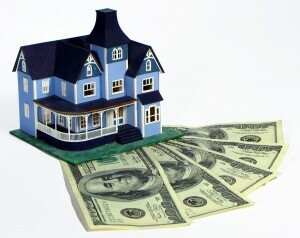 Second, how can you come up with the down payment and the other costs needed for the purchase of your first home. 1. Save – Yes, I know saving money is the old fashioned way of how to get something you want and saving does take time. But there are other options if you don’t think you will have enough money saved in time to take advantage of the first time home buyers tax credit which expires on December 1, 2009. 2. Borrow– FHA loans permit home buyers to borrow their down payment from their relatives. A great way to convince your relatives to lend you money is by telling them you will quickly repay the loan. After you close on your $140,000 home, you amend your 2008 tax return and claim the first time homebuyers tax credit. Within 4 to 6 weeks after you send in your amended return a $8,000 check from the IRS should arrive in your mailbox. If you don’t want to deal with the extra paperwork of amending your 2008 tax return, you can claim the first time home buyers tax credit on your 2009 return. The money will just arrive in your mailbox later instead of sooner. The $8,000 tax credit is phased out for single taxpayers with modified adjusted gross income levels over $75,000 and couples with modified adjusted gross income levels over $150,000. 3. Increase take home pay– If you believe you qualify for the first time home buyers tax credit, go to your employer and change your income tax withholding. Reducing your income tax withholding by the $8,000 tax credit will get the money into your paycheck to use for the down payment on your home. If you reduce your withholding and you don’t close on a home by November 30, 2009, then you will be liable to the IRS for the additional money that was not withheld from your paycheck plus interest and penalties. Before you go running into your employer’s payroll office to change your withholding, I recommend you talk with a lender and get loan pre-approval to avoid potentially having to pay the IRS interest and penalties. If you need the name of a reliable lender or you are ready to begin the search for Spring Texas homes, give us a call at 281.300.3141 or 281.804.8626 and we would be happy to help you.